Qatar’s Umm Al Houl power plant will produce 2.52GW of electricity and 590,000m³of drinking water a day. Image: courtesy of www.siemens.com/press. Dubbed as the country’s biggest independent power and water project, Umm Al Houl will serve 2.5 million homes upon completion. Image: courtesy of High Tech Systems Park. Broekman Logistics will transport Siemens’ turbines from the Port of Rotterdam to Qatar across the North Sea, the Atlantic Ocean, the Mediterranean, the Suez canal and the Red Sea. Image: courtesy of Roy Borghouts. Umm Al Houl Combined Cycle Power Plant is part of Qatar’s biggest power and water projects and will be located in the Qatar Economic Zone 3, south of the capital city of Doha. The power plant will be able to supply up to 2.52GW of electricity and 590,000m³ (136 million gallons) of drinking water a day to 2.5m homes in the area. A special purpose company named Umm Al Houl Power was formed by Qatar General Electricity and Water Corporation (Kahramaa, 60%), Qatar Petroleum (5%), Qatar Foundation (5%) and K1 Energy (30%) to manage and operate the project. K1 Energy is a consortium of Tokyo Electric Power Company (Tepco) and Mitsubishi Corp. The project will be constructed in two phases with the first phase scheduled to be completed by Q2, 2017, while the overallcompletion of the project is planned for Q3, 2018. The project is being implemented under the government’s Qatar National Vision 2030 and will help to increase electricity and water output by 22% and 25% respectively. The project encompasses the construction of a natural gas-fired combined cycle power plant along with a desalination plant. The electricity and water produced from the project will be purchased by Qatar General Electricity and Water Corporation for a period of 25 years. The plant will be equipped with six Siemens SGT5-4000F gas turbines, four SST5-4000 steam turbines and 10 SGen5-1200A generators. It will be divided into two power blocks with each block consisting of three gas turbines that will operate two downstream steam turbines. Power from the plant will be transmitted to the country’s power grid via a newly built Siemens 400kV Bul Hemmaid substation. The plant will also include process and plant drainage systems, system control and data acquisition connection between facility, substations, control centres and fuel supply systems. The desalination plant will have a capacity of 136.5 million imperial gallons a day (MIGD) of net water capacity, of which 60MIGD will be produced through reverse osmosis technology, while 76.5MIGD will be produced using multiple-stage flash technology. The plant will require large volumes of water for cooling requirements including cooling the steam produced and used within the steam turbines. Significant volumes of water will also be required for the desalination process. The plant will also include seawater intake and discharge facilities along with portable water facilities including pumping stations, reservoirs and connection pipelines as well as disinfection and wastewater treatment facilities. 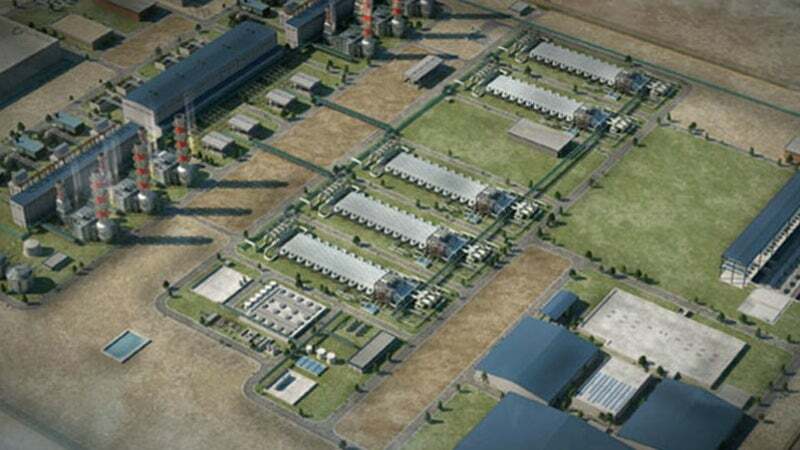 The Japan Bank for International Cooperation (JBIC) provided a loan of $1.269bn for the development of the Umm Al Houl independent water and power plant. A sum of $2.538bn has been co-financed by The Bank of Tokyo-Mitsubishi UFJ, Ltd., Mizuho Bank, Ltd., Sumitomo Mitsui Banking Corporation, Mitsubishi UFJ Trust and Banking Corporation, Sumitomo Mitsui Trust Bank, Limited, the Norinchukin Bank, Qatar National Bank, and KfW IPEX-Bank. "Power from the plant will be transmitted to the country’s power grid via a newly built Siemens 400kV Bul Hemmaid substation." An engineering, procurement and construction (EPC) contract has been awarded to Samsung C&T to construct the complete facility. An EPC contract was also awarded to Hitachi Zosen constructing the potable water blending plant. The gas and steam turbines, and generators will be supplied by Siemens under a service agreement. As part of the agreement, Siemens will also provide an electrical and a resident engineer for the site. Nexans has been selected to provide 575km of power cables including MV and LV cables, while Doosan Hydro Technology has been awarded a contract for the water treatment and waste water treatment system. Control systems for the power and desalination plants will be provided by Yokogawa Electric Corporation’s subsidiaries Yokogawa Electric Korea and Yokogawa Solution Service Corporation, while high-pressure valves will be supplied by HP Valves. ABB has been contracted to supply turnkey substations to transfer the electricity generated to the grid. The substations will be at 400kV and 220kV/132kV, equipped with gas-insulated switchgear as well as advanced control and protection, and telecommunication systems. The design and construction of the desalination plants will be completed by ACCIONA Agua, who will also be responsible for their operation and maintenance.